Speed and technology have become potent ingredients in Viet Nam’s sizzling food delivery market. The food delivery market has been boosted by e-commerce and become fiercely competitive and efficient. Delivery times have been shortened from one day to two hours to 60 minutes. According to a report by Havas Riverorchid, 63 percent of consumers choose "convenience" and "quick" as reasons for using delivery services. The latest report by GCOMM market research company, which surveyed 600 people in Hanoi and Ho Chi Minh City, found that 96 percent of respondents said delivery speed was the most important factor in making a choice of food delivery services. The survey also rated GrabFood as the number one food delivery service in terms of speed with about 80 percent of customers agreeing with the statement "GrabFood is the fastest food delivery service in Viet Nam". This result surprised everyone because GrabFood is classified as a newcomer in comparison with other food delivery services in the market such as Foody/Now.vn and Vietnammm. To take the lead in the speed race with an average of 20 minutes for a delivery, Grab has its certain advantages. Grab shippers wait at a milk tea store to order and make deliveries. "Firstly, GrabFood gets a huge amount of data from its parent company – Grab – with a wide network of merchant-partners (increasing tenfold since June) and a large number of driver-partners in the market," a Grab representative said. In addition, GrabFood also benefits from Grab's technology ecosystem. Users can book a GrabCar or GrabBike to go to work, send goods by GrabExpress, order food via GrabFood and make payments with GrabPay by Moca. Grab also introduced the GrabReward feature to reward loyal customers with preferential policies. GrabFood's delivery speed is also determined by GrabBike's large driver-partner network. This means GrabFood had a massive number of delivery partners in advance. "The wide and dense network of driver-partners gives us special advantages. 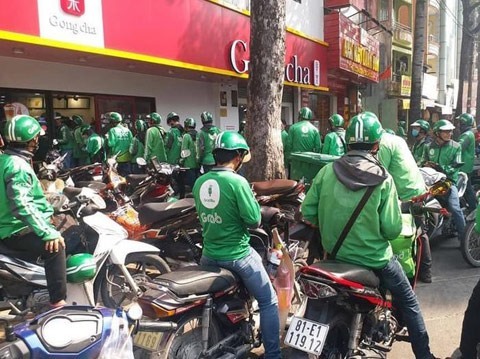 GrabFood's next goal is to strengthen the merchant-partner system so that customers can find the nearest restaurants, further shortening the delivery time," said Jerry Lim, Country Head of Grab in Viet Nam. A Euromonitor report said the food delivery market in Viet Nam was worth about $33 million in 2018 and is expected to top $38 million by 2020. It predicts this trend will gradually become a habit. The GCOMM report also showed 99 percent of survey respondents use the service at least two to three times per month; 39 percent use it two to three times a week. Being aware of the huge potential from the market and what matters to customers, food delivery brands have tried to better the customer experience by focusing on speed. Now.vn committed to delivering food in 25 minutes; Lala said they took 30 minutes. As a “rookie” in the market, GoFood also put the criteria of speed in its slogan "Mon gi cung co, ma con giao nhanh" (Any dish is available, and delivered fast). However, the business is tough. Some big names like FoodPanda have withdrawn from the market. Among the most popular apps (Lixi, GrabFood, Foody/ Now.vn, GoFood, Lala and Vietnammm), Lixi and Lala have reported slow business. The food delivery market is expected to continue to generate fierce competition among different firms, much like in the ride-hailing market earlier. However, unlike the ride-hailing battle, releasing the most attractive promotional programmes cannot decide the winner in the food delivery market; speed and quality will be the most important factors instead. In the broader context, experts believe the beneficiaries will eventually be Vietnamese consumers when in the future they will have a wide variety of superapps serving all their needs with just one tap.